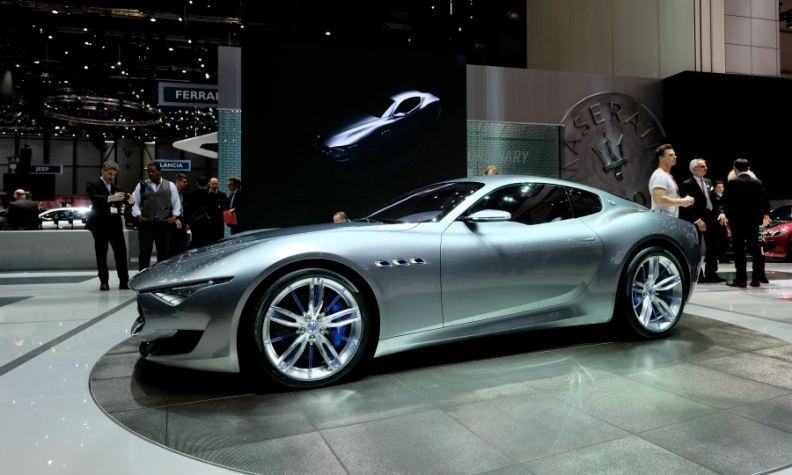 The Maserati Alfieri concept, shown here in Geneva, would need little change to go into production, Fiat says. MILAN (Bloomberg) -- Maserati will probably increase production and add the Alfieri sports car to its lineup after orders at the upscale Italian brand have almost tripled compared with 2013, people familiar with the matter said. Maserati is getting 3,500 orders monthly, Harald Wester, who runs the brand, said in an interview. That would amount to sales of 42,000 cars this year, compared with the 15,400 sold in 2013. Fiat CEO Sergio Marchionne's new business plan for Fiat Chrysler Automobiles is likely to include a commitment to proceed with a high-end sports car based on the Alferi prototype that Maserati displayed at the Geneva auto show in March, sources said. The plan will be unveiled in May. Maserati could begin production of the Alfieri coupe within two years, shortly after the brand launches the Levante SUV in 2015, Automotive News Europe reported in March. The Alfieri would be a rival to the Porsche 911 Turbo and the Jaguar F-Type. Fiat is considering adding a third shift at the Maserati plant in the Turin suburb of Grugliasco after about 50 employees worked some nights putting finishing touches on Maserati vehicles, sources said. Plant workers have been putting in extra weekend hours to meet demand as well, they said. The plant builds the $66,900 Ghibli and $102,500 Quattroporte, both of which went on sale last year. The site produces about 140 cars a day. "The factory is running like a Swiss clock" amid the order jump, Wester said in an interview with Bloomberg Television last month. Maserati will probably generate enough earnings in 2014 to counter losses at parent Fiat Group's mass-market European operations. Maserati's 2014 trading profit may jump 48 percent to at least 254 million euros ($350 million), according to Bloomberg calculations based on company presentations. Maserati's revenue more than doubled to 1.66 billion euros in 2013, while trading profit, or earnings before interest, taxes and one-time items, tripled to 171 million euros. The division has a goal this year to increase revenue another 53 percent, with trading profit targeted at a "double digit" percentage of sales, according to Fiat presentations. That indicates earnings of at least 254 million euros, outweighing the 230 million-euro loss that analysts at Mediobanca Securities predict for the Fiat, Alfa Romeo and Jeep brands in Europe. Fiat declined to comment on the estimates or the automaker's strategic plan. Deliveries by Maserati this year may climb 88 percent to 29,000 cars, with sales in North America surging 95 percent to 9,600 vehicles, according to research company IHS Automotive. Marchionne is starting with Maserati as he shifts Fiat's focus from volume models in Europe to more profitable luxury autos. The marque is expanding to tap into rising premium-car demand that has led to record sales at competitors BMW, Audi and Mercedes-Benz. "We are equipped to go on the attack against the giants in our industry," Marchionne, 61, said in Turin last month at Fiat's annual shareholders' meeting, where he concluded his speech by screening Maserati's "Strike" television commercial that aired during the 2014 Super Bowl. "Our strategy to expand into the more profitable premium segments has clearly begun to generate results." Marchionne is positioning Maserati to challenge the German producers' most expensive models, with a rejuvenated Alfa Romeo taking on their mid-level offerings. "Maserati is presenting itself to Americans as an Italian alternative to BMW and Audi, and awareness went viral with the Super Bowl commercial," said Andrea Boaretto, a marketing professor at MIP Milan Polytechnic. "So far their message has been successful at catching American drivers looking for something different from German premium carmakers with the same level of quality." The Ghibli has attracted younger buyers to the brand in the United States, with customers in their late 20s rather than the previous average age of about 45 years old, said David Gnader, sales manager at the Boardwalk Maserati dealership in Plano, Texas. "It does draw in a different brand owner" from rivals such as Mercedes, Audi and Lexus, he said. Jochen Gehrke, an analyst at Deutsche Bank in Frankfurt, said Maserati's portfolio will continue to bear fruits. "However we note the limited scale of Maserati to the group," he wrote in a note to clients today. Exor, the company which controls Fiat, will hold its annual meeting at Maserati's Grugliasco plant on May 22 to show investors "how much care and precision goes into making these wonderful automobiles," Chairman John Elkann said in his annual letter to shareholders last week.